Born at 5 Stannus Street in Windsor, he was a son of the late Dundonald and Maude (Ward) Smith. It is with extremely heavy hearts that we announce the passing of our beloved Dad. A fantastic father and a kind, generous and caring soul. Preceded in death by his loving wife, Pauline "Miz Polly" (Lynch), they are together again for an eternity. He is survived by two daughters, Paulette (Larry) Fischer and Donna Smith. Papa (Smiff) Smith will be greatly missed by his grandchildren, Marcail (John), James (Desiree), Alexander (Terra), Katrina, Donald (Alison) and nine great grandchildren. He is also leaving behind his sisters, Catherine Watson, Helen Poehl, Denise Rodgers and Judy McCullum; many loving nieces and nephews as well as extended family members and friends. Predeceased by brothers, Guy and Ted and sisters, Mary, Nita and Louise. He worked for many years with Wade Enterprises and most will remember him from Country Gardens IGA. 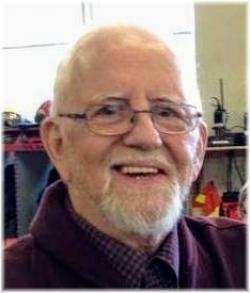 He was a founding father of the New Minas Fire Department, a Veteran and an active member of the Kentville Legion, Kings Branch No. 6. Dad and his very best friend of 47 years, Mike Samson, spent countless hours involved in Legion business and the many fishing and hunting trips. He loved dancing, bowling, playing ball, telling tall stories and playing tricks on the kids and anyone else gullible enough to fall for them. The two headed smelt comes to mind. Cremation has taken place. There will be no visitation, by request. A combined Royal Canadian Legion and funeral service, followed by a reception, will be held at 2:00 p.m. on Monday, April 29, 2019 in the White Family Funeral Home, Reverend Garnet Parker officiating. A private family burial will take place at a later date. Donations in memory may be made to the Heart and Stroke Foundation or the charity of your choice. Funeral arrangements have been entrusted to the White Family Funeral Home and Cremation Services, Kentville. On-line condolences and inquiries may be directed to www.whitefamilyfuneralhome.com.